It seems that my go-to meal for dinner is chicken. But having chicken a couple times a week… week-after-week can get so boring. That’s why I was so thrilled to find Aleia’s Coat & Crunch. Aleia’s Coat & Crunch is also easy to prepare. Just coat the chicken and bake. And next thing you know, you’ll have a perfectly seasoned and crunchy chicken dish that your whole family will love. This quick and easy fix will make boring chicken a thing of the past! The Coat & Crunch is also gluten-free, dairy-free, corn free, has no trans fats, and is kosher and non GMO. There will be two winners of this Win-It-Wednesday. 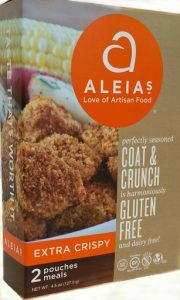 Each of the two winners will receive a box of the Aleia’s Extra Crispy Coat & Crunch. One (1) winner will be randomly selected to win from the entries received before Tuesday, October 24 at 11:59 PM EST, and one (1) more winner will be randomly selected to win from the entries received between Wednesday, October 25 and Tuesday, October 31, 2017 at 11:59PM. SO – make sure you enter two times to win! This entry was posted on Tuesday, October 17th, 2017 at 4:56 pm	and is filed under Win-It-Wednesday. You can follow any responses to this entry through the RSS 2.0 feed. You can leave a response, or trackback from your own site. My favorite meal is fish so this Aleia’s coat & crunch batter would be perfect. My favourite meal for dinner is Fish N Chips! My favorite meal for dinner is Meatloaf with mashed potatoes and gravy. My favorite go to meal is home made soups. My favorite is when someone else cooks and it’s safe for me. It also changes depending on my taste and the weather and how long it’s been since I’ve had it. A never fail option (just in case you want to surprise me sometime) is salmon with lemon, dill, salt and pepper; grilled asparagus; a nice mixed greens salad with a few veggies on top (tomato, cucumber, seeds or nuts, bell pepper….whatever); and a small square of dark chocolate with peppermint tea a half hour or so after. Hard to beat that! Our favorite meal this time of year is broccoli soup. Made with potatoes, you don’t need flour or cream to thicken! Gets some veggies in the kid and tastes great. My favorite meal is spagetti, sausage, and homemade gluten free meatballs with homemade tomatoe sauce. My favorite meal for dinner is pork roast with wild rice. I make my own GF stuff! Hmmm…. My favorite meal for dinner is spaghetti, crusty garlic bread and a simple salad with Italian dressing. I also like to have Chicken Parmesan, which would be great with Aleia’s Coat & Crunch. Any kind of bacon cooked crispyand strained on paper towel. Any kind of sausage or dogs cooked to your liking in large pan, mixed with onion sautéed in olive oil, coconut nut oil or oil of your choice(can remove the sausage or dogsAdd sour kraut (moisture squeezed out) cook till and bar-b-que sauce (a few tablespoons or more) enough to satisfy your flovar buds. I like Jack Daniels. But you can make you Gluten Free bar-b-que sauce and mix it all together in the pan cover heat to desired liking. 1) bacon cooked till krispie, set on paper towel to cool so can be crumbled before mixing in with sour kraut mix. You can cook dogs first in same pan before bacon or throw them in together. 2) leave bacon drippings in pan if desired (or discard). Sauté sliced onion of choice in bacon drippings or oil. I like sweet onions or vidilia when in season. 3) leave onions in pan, add moisture drained sour kraut mix together well. Add dogs ,sausage mix throughly, add crumbled bacon mix throughly. Add bar-b-que sauce for an extra zing. Cover, heat to desired liking,serve with mustard of choice. I like mustard. But it’s extremely tasty without the mustard. It’s a great one pan dish that’s easy for a serve -it -yourself -meal. I put left in microwave bowl for next night. Never tried to freeze leftovers but I guess you if it’s vacuumed sealed. PORK ROAST BAKED POTATO AND VEGETABLE.